Covered porch, round-top windows, a two-level foyer, and a bank of clerestory windows give modern flair to this two-story farmhouse floor plan. Columns between the generous great room and island kitchen add to the drama, while a large rear deck expands living space outdoors. 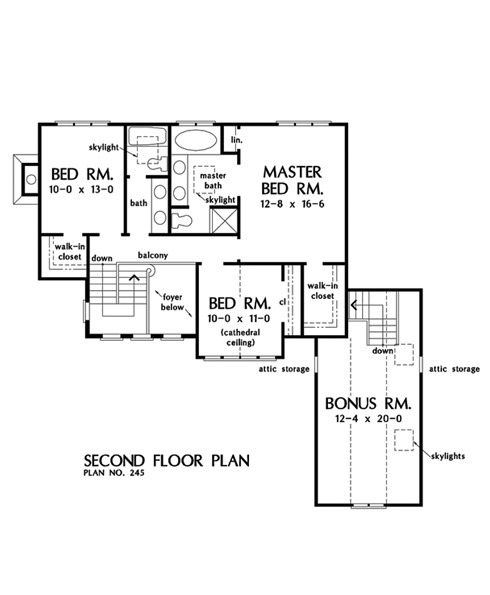 The second-level master suite has walk-in closet, double lavs, shower, and garden tub. Two additional upstairs bedrooms share a full, skylit bath. Growing families will appreciate the "elbow room" added by the skylit bonus room and attic storage over the garage. 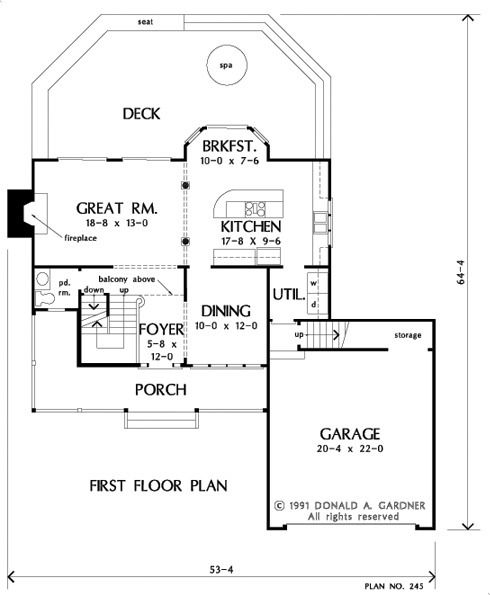 1st Floor: 943 Sq. Ft.
2nd Floor: 840 Sq. Ft. Bonus Room: 323 Sq. 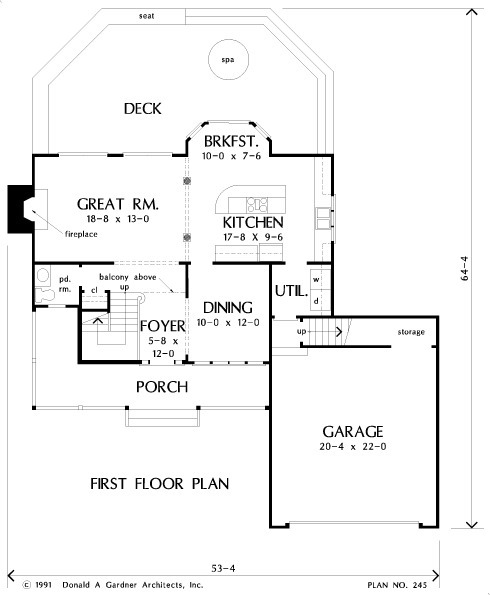 Ft.
House Dimensions: 53' 4" x 50' 4"
Great Room: 18' 8" x 13' 0"
Master Bedroom: 12' 8" x 16' 6"
Foyer (2 Story): 5' 8" x 12' 0" x 17' 0"
Dining Room : 10' 0" x 12' 0" x 8' 0"
Great Room : 18' 8" x 13' 0" x 8' 0"
Kitchen : 17' 8" x 9' 6" x 8' 0"
Breakfast Room : 10' 0" x 7' 6" x 8' 0"
Bonus Room (Vaulted): 12' 4" x 20' 0" x 8' 0"
Garage : 20' 4" x 22' 0" x 0' 0"
Garage Storage : 12' 6" x 3' 4" x 0' 0"
Master Bedroom : 12' 8" x 16' 6" x 8' 0"
Bedroom #2 : 10' 0" x 13' 0" x 8' 0"
Bedroom #3 (Cathedral): 10' 0" x 11' 0" x 12' 0"
Porch - Front : 23' 8" x 5' 8" x 0' 0"
Deck / Patio : 37' 4" x 18' 0" x 0' 0"
Balcony : 17' 6" x 3' 6" x 8' 0"